The French science fiction film Lucy did reasonably well at the U.S. box office, bringing in $43 million, but it was a smash sensation globally raking in more than ten times the North American box office. It also holds the distinction of being the first science fiction movie partially filmed using IMAX cameras, which gives it a hyper-real sheen in all the right places. The guarded enthusiasm in the United States is often explained by the fact that Lucy had only two recognizable names, Scarlett Johansson in the title role and Morgan Freeman in an expanded cameo. I'd like to suggest, though, that U.S. audiences got it right: Lucy is assuredly worth a rental, but it's far too uneven to rank as a great film. If you like shiny surfaces and intriguing speculation, Lucy is full of both. It opens (and ends) with cells colliding and dividing and quickly cuts to a misty prehistoric dawn where a female Australopithecine is watering. As we learn, she is "Lucy," the sensational 1974 fossil find of paleontologist Donald Johanson that literally rewrote the story of human evolution. Flash to the 21st century where another Lucy (Scarlett Johannson) is a 25-year-old student in Taipei lured by a shady boyfriend into the next leap in human evolution. He forces her to carry a briefcase into a bank and before you can say "Australopithecus" she's spirited away, witnesses murders, is sedated, and awakes to find herself as one of four individuals with bloody stitched slits in their guts. Each has one opportunity to live–become unwilling drug mules to Paris, Berlin, London, and Rome, where they will be relieved of the contents of their tummy tucks. It's sci-fi, baby, so you know they aren't packing anything as mundane as coke or heroin. A group of unscrupulous Taiwanese scientists has synthesized the hormone pregnant women secrete to help fetal skeletons and brains develop. Ingested in small quantities, the drug opens Huxley's doors of perception and gives access to more than the 10% of the brain humans normally use. Before Lucy even boards the plane, though, something goes awry (because it is sci-fi, baby). In a very disturbing scene, Lucy is brutally beaten when she rebuffs the sexual advances of some Taiwanese thugs. A kick to the stomach ruptures the bag she is carrying—doses meant for hundreds of users. As neuroscientist professor Samuel Norman (Freeman) explains in a conference crosscut, if humans could access 20% of their brains, they could control their own bodies, objects, and others. But what would happen at 30%? 50%? 100%? 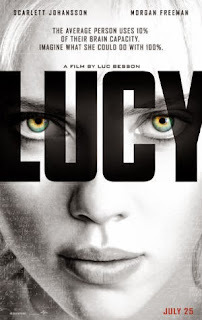 Director Luc Besson acknowledges that Lucy is a pastiche of three other films: Léon: The Professional (1994), the story of an assassin, which he wrote; the popular mind-altering film Inception (2010); and Stanley Kubrick's path-breaking 2001: A Space Odyssey (1968). Be warned: the violence in this film is Quentin Tarantino-like in its bloodiness and its amorality. The attack on Lucy transgresses the border between advancing the plot and misogyny—so much so that it is very tempting to stop the film. Obviously, Lucy survives, but I leave it to your judgment to determine if what follows is worth it. The film is certainly open to intense criticism on this score, as well as whether Besson's mix of violence, drugs, and the future of humanity is intriguing conceptually, but too uneven on the screen. Drug overlord Mr. Jang (Choi Min-sik) pursues Lucy to Paris–where she hopes to enlist the aid of Professor Norman–and we get numerous showdowns with thugs, a car chase across Paris, and a beat-the-clock dénouement. Once again, it's probably a personal judgment call as to whether all of this is really innovative f/x, or just your run-of-the-mill chase scene dressed up in fancy clothes. Ditto the question of whether Besson has solved the mystery of Kubrick's black obelisk and written the next chapter of the space child, or whether he has merely contrived his way to 2001 Lite.